Smoky chicken sate plucked from a grill and dipped in sweet-spicy peanut sauce in a Jakarta alley. Steamed ground rice and jaggery cakes eaten from a banana leaf on a street corner in Penang. A mound of sticky rice drizzled with coconut cream and topped with juicy mango slices spooned up at a stall in a Chiang Mai market. For the Asia-bound traveler keen to know the region’s diverse culinary cultures, these are essential experiences. 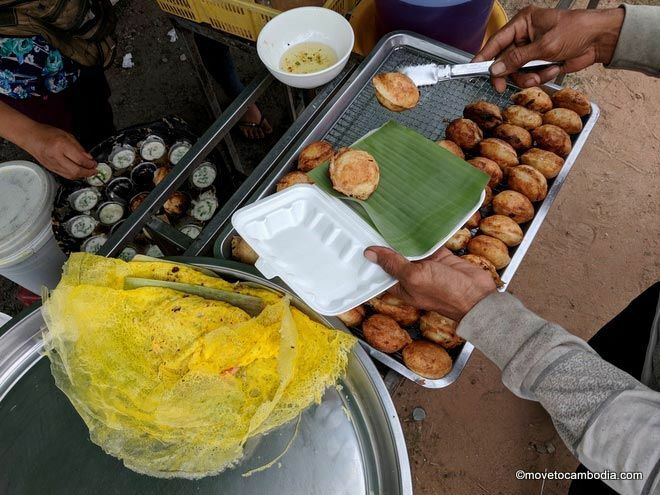 Num krok, made from rice flour, coconut milk, and spring onions, being sold on the streets of Siem Reap. In this part of the world the term “street food” (or “hawker food,” as it’s referred to in Malaysia and Singapore) denotes not just a cheap and quick way to fill one’s belly. It also describes a repertoire of dishes prepared by experienced specialists, dishes rarely duplicated successfully in restaurant kitchens. Eating on the Asian street offers the opportunity to observe cooking techniques up close and to engage with strangers over a meal in a way that would be difficult in a proper brick and mortar eatery. There’s just one problem: Asian street food makes a lot of travelers ill. The World Health Organization has designated the developing countries of Asia as among the most high-risk destinations for “traveler’s diarrhea,” which means that more than 50 percent of visitors to most countries in the region have a chance of getting ill from what they eat. So what’s the intrepid foodie to do? Recent studies suggest that travelers who ingest one of two types of prophylaxis prior to and during travel may be able to increase their resistance to food poisoning. Some pro-biotics or “friendly germs” — such as those found in cultured milk products like yogurt — secrete antimicrobial substances that inhibit harmful bacteria. And bismuth subsalicylate or pink bismuth, the active ingredient in popular stomach medications such as Pepto-Bismol, has been shown to decrease the incidence of traveler’s diarrhea when ingested four times daily. But the latter has potential side effects, and pro-biotics doubters point out that our intestines already maintain an equilibrium of beneficial bacteria. “Anything above the equilibrium is likely to just be flushed from your system,” says Wilaiwan Petsophonsakul, a medical researcher at Chiang Mai University in Thailand. The U.S. Centers for Disease Control and Prevention (CDC) advises avoiding street food altogether, as well as raw or undercooked meat and seafood, cooked foods served at room temperature, raw fruits and vegetables that you haven’t washed and peeled yourself, and beverages made with water or containing ice. That would mean missing out on hundreds of local specialties, including dandan noodles in Sichuan; Malaysia’s strong, milky iced coffee, green papaya and other salads in Thailand; shrimp and herb-stuffed rice paper rolls in Vietnam and curries — which in Southeast Asia are often cooked in the morning and then served at room temperature — just about everywhere. Eating on the street in Asia isn’t always more dangerous than eating at home. Food safety website Barf Blog chronicles weekly outbreaks of hepatitis A and other food-borne illness in the United States and links to food safety-related news from overseas. Produce is often contaminated at the farm, from human or animal feces, and then carries its bugs to the street stall. Heat kills them. “You shouldn’t eat poop,” is Powell’s blunt advice. “But if you’re going to eat it, make sure it’s cooked.” Street food vendors have a particular challenge because they work in small spaces, facilitating cross-contamination between “clean” and “dirty” foods. But street stalls also boast an advantage over restaurants: transparency. At a street stall everything is prepared right in front of the consumer, which makes it easier to gauge food safety. 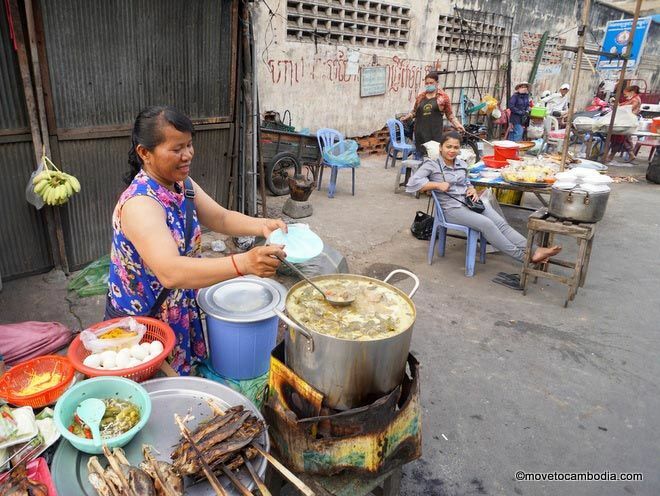 Street food in Phnom Penh, Cambodia. Use your eyes. Refrigeration, temperature control and good personal hygiene on the vendor’s part reduce the likelihood of your contracting a food-borne illness. Does the vendor keep hot foods hot and cold foods cold? Are raw foods kept separate from cooked foods? Does he keep his hands clean? Raw garnishes on cooked dishes aren’t necessarily worrisome, as long as the garnish is kept away from raw meats, for instance. Locals get sick, too, and won’t return to stalls suspected of serving unsafe food. When surveying the street food scene in any location, look for crowds. Be aware of local meal times. It’s common — and generally safe — to eat curries, stir-fried vegetables and other dishes at room temperature from buffet-style displays in many Asian countries, but you’re asking for trouble by showing up after what’s offered has been picked over. Arrive a bit before meal time, when foods are not long off the burner and before they’ve been attacked and even handled by other customers. “There are traditional cooking and food preparation methods that eliminate microbes,” says Powell. Fermented foods, for instance, are generally thought to be safe. Acidic foods (made with vinegar, lime juice and other souring agents) are rarely associated with outbreaks. Dishes such as Indonesian/Malaysian rendang and northern Thai muu kem (salted “confit” pork) are made with techniques that allowed them to be kept for months before the advent of refrigeration. Don’t be taken aback to encounter them served at room temperature. Become familiar with spices, such as chilies and turmeric, that are known to have anti-bacterial properties and seek out dishes that include them. Exercise extra caution on the street if eating with children younger than 10 years of age who have yet to fully develop an adult’s natural immunities to harmful bacteria. Note that at age 55, adults begin to lose T cells (a group of white blood cells that play a role in immunity) and are thus less able to stave off the effects of ingesting harmful bacteria. You needn’t shy completely away from peeled fresh fruit, but those with porous exteriors that grow on the ground (such as cantaloupe) are more prone to contamination prior to and during harvesting. Acidic fruits, such as citrus fruits and pineapple, are safer bets. Ice is generally safer in countries where iced drinks are widely consumed and made on a large scale in central facilities. Few travelers get sick from consuming iced coffee, tea or beer in Vietnam, Thailand, and Malaysia for instance. 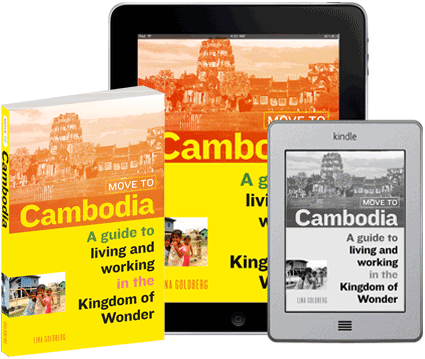 Want some help eating street food in Cambodia? 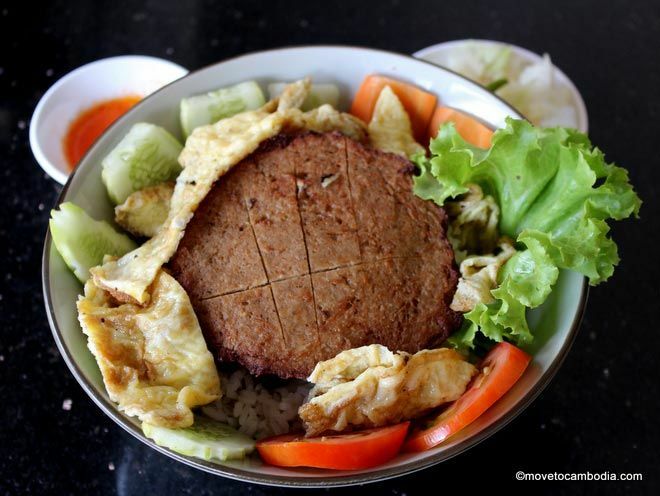 Check out Phnom Penh Food Tours and Siem Reap Food Tours for a guided tour of Cambodia’s most delicious dishes. This entry was posted in Health & Safety, Food and tagged street food, Cambodia street food, Siem Reap Food Tours, Phnom Penh Food Tours. Bookmark the permalink.